This is an age of color. Recent years have seen a remarkable increase in its use in interior decoration — and not alone for its mere decorative value, but for its effect upon happiness and well-being. Color in the world out-of-doors affects our moods, our outlook upon life. And properly employed within the house, it has a like effect. 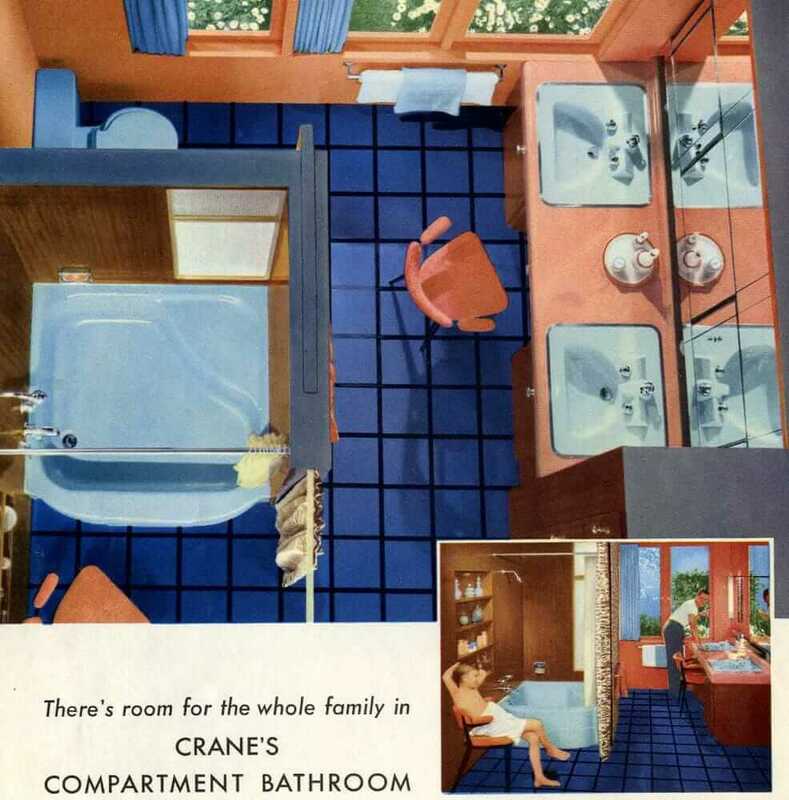 The bathroom has, of course, shared in this growing use of color. 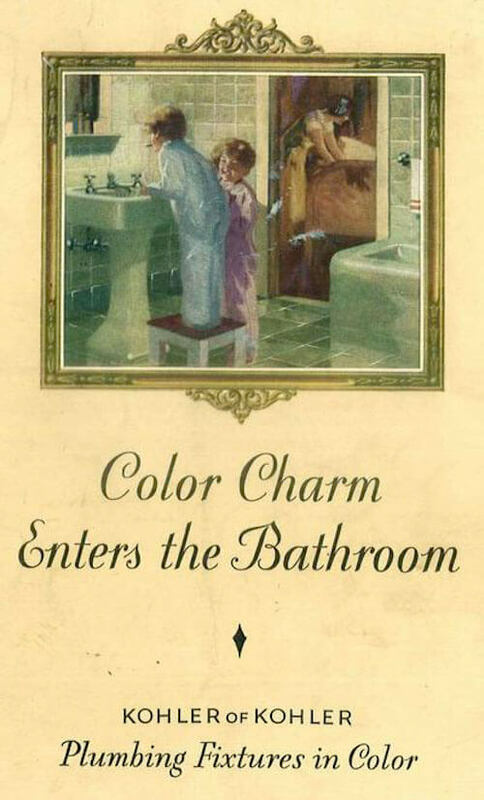 Bright touches have appeared in towels and rugs and window hangings, and latterly, in shower curtains. It has crept into walls and floor, and sometimes to the very rim of the bath tub. But there, in most instances, the color stopped. 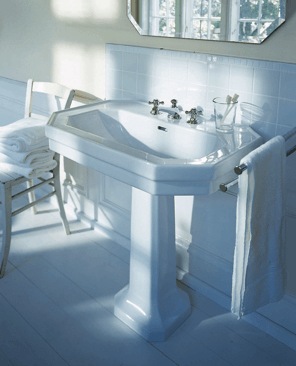 The most important things in the bathroom — the plumbing fixtures — were white. We perhaps got to thinking that they had to be white. And the like was true of the kitchen and laundry. 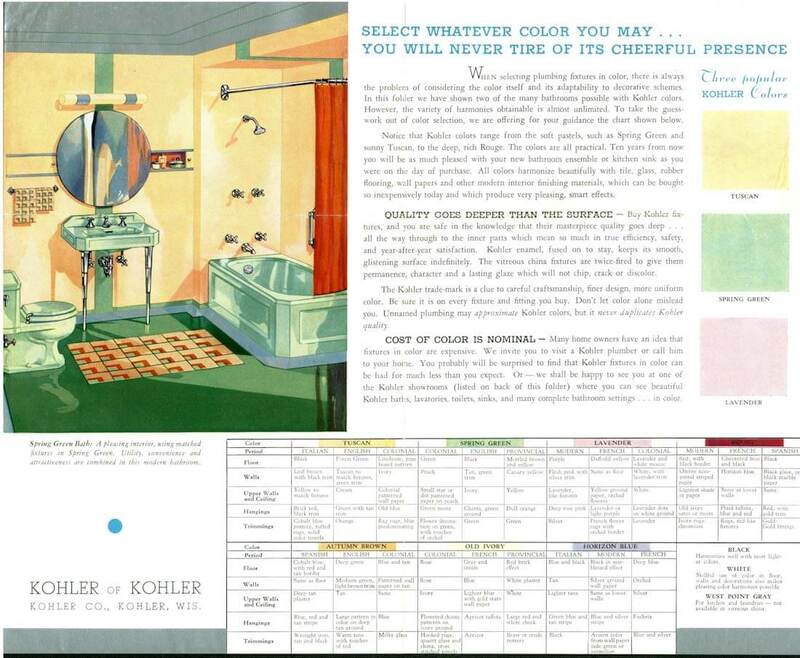 Kohler Fixtures in Color: So the announcement of Kohler Plumbing Fixtures in color was really a major innovation. We had color in the bathroom; now we have the bathroom in color — a complete color ensemble, a new color charm…. six lovely permanent shades, of blue, green, gray, brown, lavender and ivory. 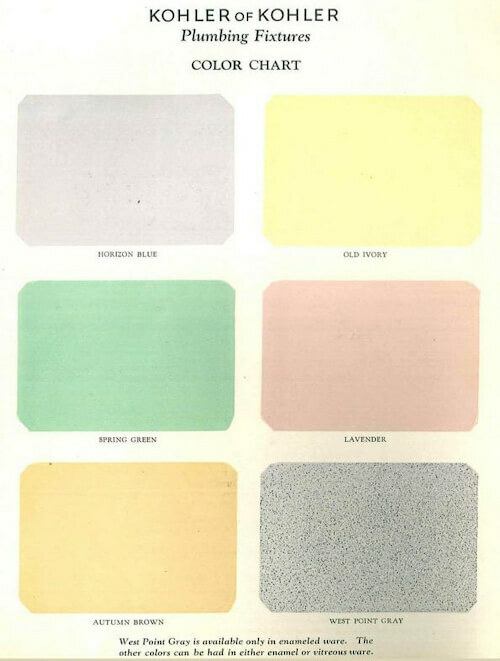 It’s so interesting to see the color combinations in 1927. Lavender and yellow and green — why not! 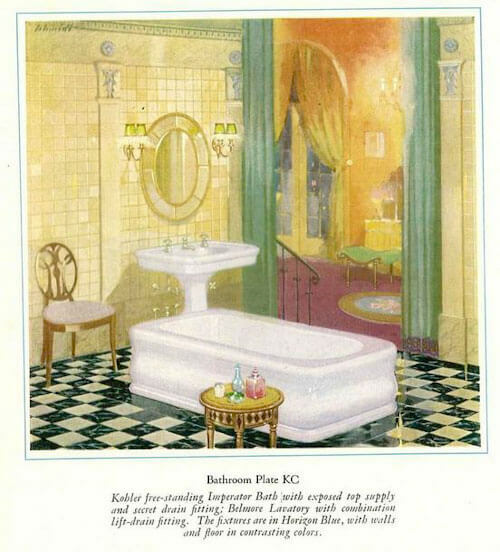 Also, I love tile run this high all around a room… and a tub/shower that’s arched or built in: Yum. 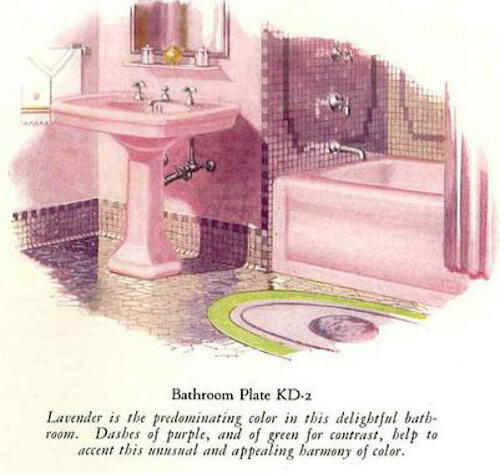 Here’s another image that Kohler sent to me, read the color and decorating combinations that the company recommended back in the day. 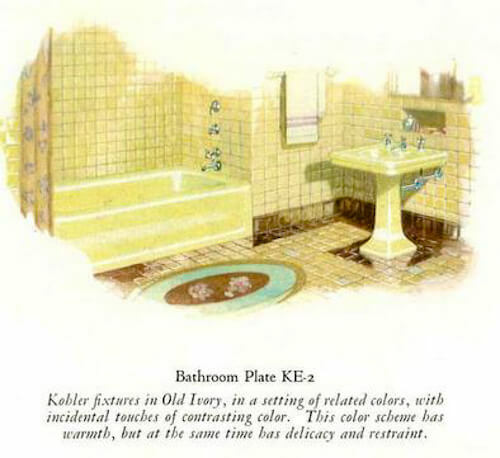 See Kohler’s excellent timeline capturing the history of their color introductions — although the color rendered on the computer screen seems questionable. 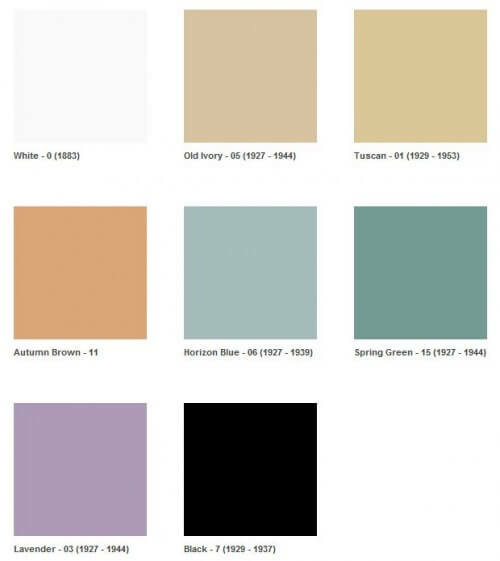 See Kohler’s current lineup of bathroom fixture colors. Thanks to archive.org for featuring this catalog. 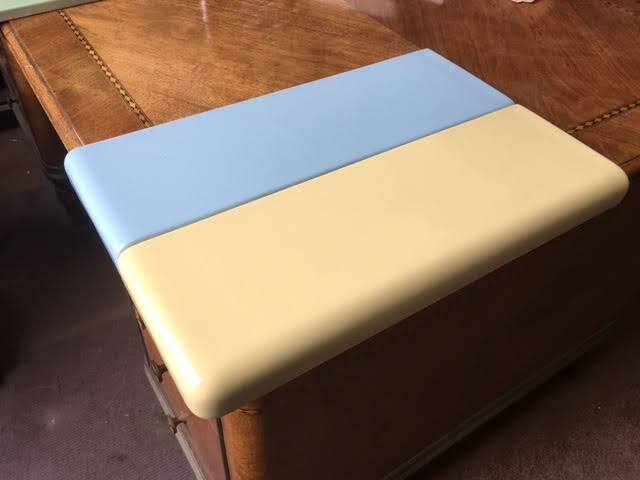 Readers, which of these first colors is your favorite? My first choice would probably Horizon Blue, but I didn’t see a large picture featuring that color. Second choice would be the Old Ivory. OMG! 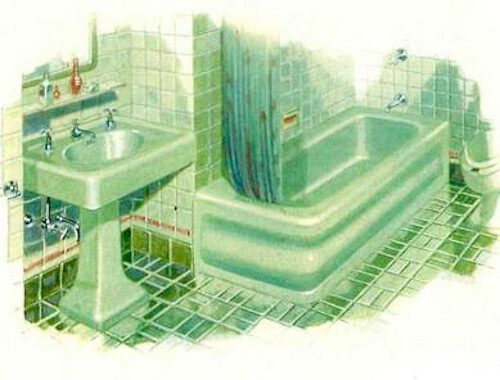 This must have been like magic bathrooms back then! Plus the way they display the floors shining like the Emerald City! How marvelous. Thanks for sharing! Really made me smile. Wow, are those beautiful bathrooms! 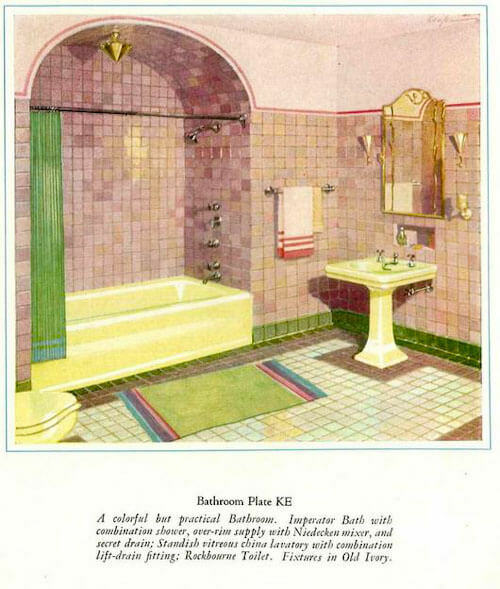 I can report very accurate uses of those colors, as I briefly owned a 1930 Tudor in New Jersey that had the EXACT color scheme of the third picture, with lavender and green tiles, and the ivory/yellow fixtures. 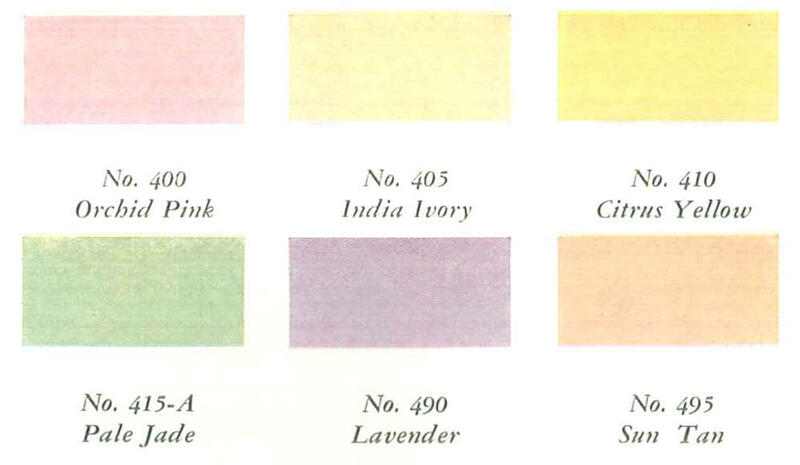 I remember thinking it was a bizarre mix at the time but the lavender was indeed lavender, but certainly veering more towards the pink side of the spectrum than the blue. The color in that picture (not the swatches) seems very accurate. 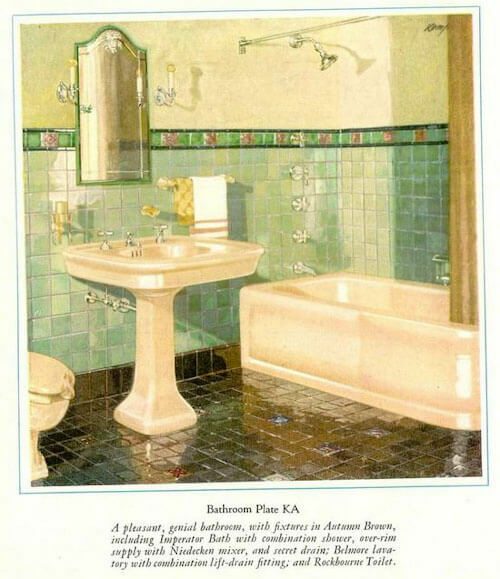 The other bathroom also had beautiful original tile, in black and what looks like the “autumn brown” listed above. Had white fixtures though. Sigh. Didn’t own the house long though -turned out to be too big! 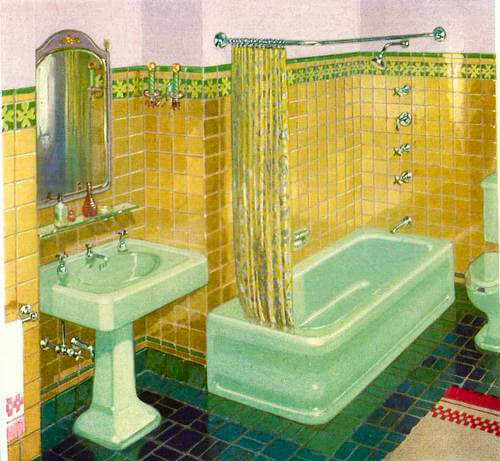 I always have wondered at what point in design history that home owners became afraid of COLOR. The illustrations are fantastic! 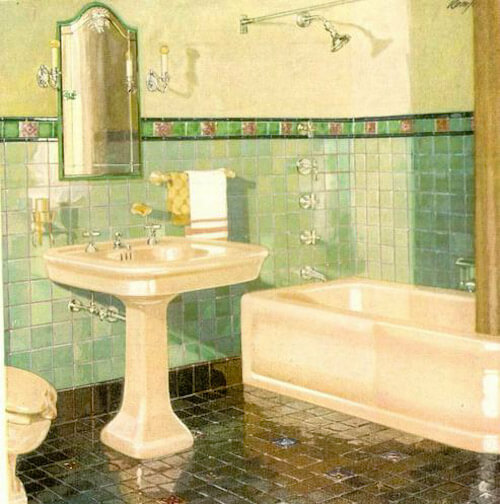 I totally love the colors of the fixtures as well as the contrasting tile and decor. I think part of the “problem” now is that owners are afraid that they won’t be able to sell their home if they decorate as they wish. Too bad. My home is colorful and frankly, I don’t care what any potential buyers think. I love it so much, I don’t intend to sell anyway. That Spring Green! Oh. My. Gosh. Old Ivory is beautiful too but that jade green just… ooh. Such a cool colour. The reproduced green doesn’t look the same at all? Like, not even a little? 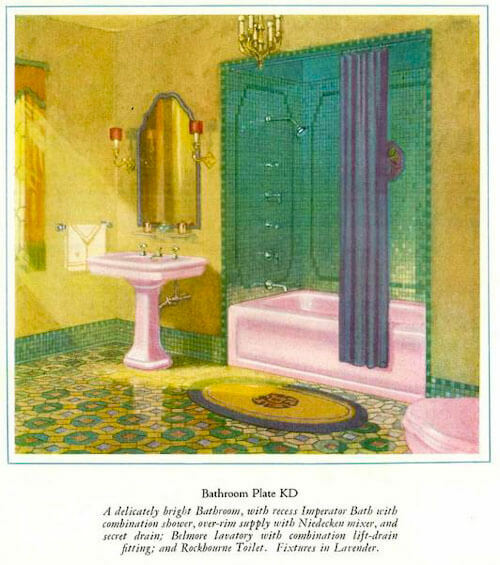 How amazing is that tesselated floor in that one “delicately bright” bathroom with the lavender fixtures and green and yellow floor? I’m not game, but its astonishing. 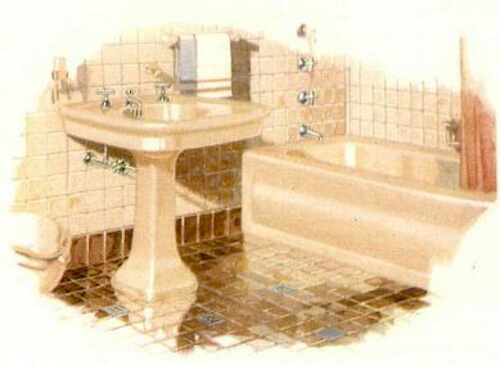 The checkerboard floor in the pic below it, with the freestanding tub? Just wonderful. I would have that. I can’t figure out how they did the wall columns though, is that all tile? So Nero Wolfe.